What if a community has been hit by a natural disaster so powerful, and so destructive, that there isn’t much, if any, internet to measure? What if rather than measuring internet performance levels across an entire country, the goal is just to get the the internet back up and running? Fast. Online communication is one of the most important steps to disaster recovery in the aftermath of a natural disaster. Without reliable internet, efforts to deliver aid, conduct rescue missions, and stimulate the local economy can be seriously impaired. 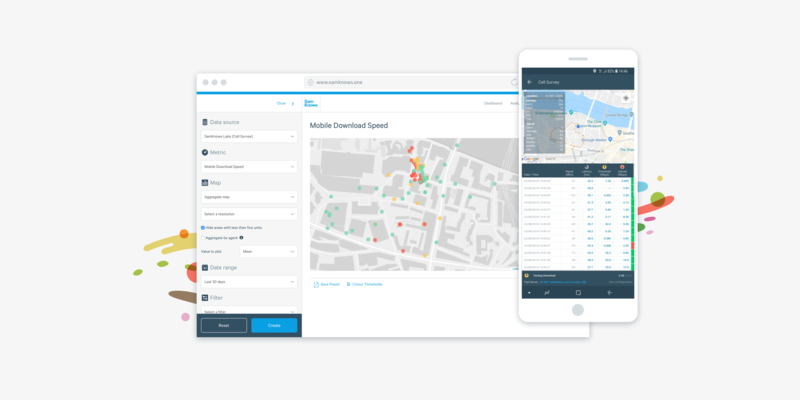 The SamKnows Cell Survey app is designed to help emergency response teams track and restore internet infrastructure quickly and efficiently. Developed for Android only, the Cell Survey app runs a series of tests in a continuous cycle, always checking for signal availability, as well as collecting comprehensive environmental data from connected cell towers, such as signal strength. The results then reveal the performance levels by time and location, as well as areas where there is no internet access at all so that it’s easy to identify damaged cell towers. As well as successful tests, the app also captures failed tests, and all corresponding environmental data is submitted to SamKnows One, our cloud-based data management platform, when the device has an active internet connection. Choice of test server — the app finds your current location and provides you with a selection of SamKnows test servers that are available in your area. Choice of tests — the user can select from a choice of download, upload, and latency. Test parameters — the user can modify certain test parameters, including test duration. Inter-test duration and inter-cycle delay. Inside the app itself, you can see an overview of the current test cycle’s results. The map at the top of the screen plots the test type that has run at each specific location, using color-coded dots. The small table to the left of the screen displays your environmental data, all in real-time, which updates automatically. And then below the map is a larger table that gives you an overview of the test results, again in real-time. The display in the user’s device is meant for reference only. But for more in-depth analysis, users can go to SamKnows One to view all their historical test results and environmental data. SamKnows One visualises your internet performance by providing charting and mapping tools for extensive analysis, a customisable dashboard, and the ability to manage historical results. One of our favourite features available in SamKnows One are the maps which reflect how performance varies by area, including where tests have failed, by using a customisable traffic light system and providing a quick and easy way for users to spot trends in the results. We’re already using the Cell Survey app in areas that have suffered and continue to suffer the after effects of hurricanes. Some teams are using the app to benchmark mobile internet performance so that any damage caused to cell towers is easy to spot when testing during and after storms hit. Others are using the app for drive testing to track improvements that service providers are making to mobile infrastructure. Great! We’re here to help. If you would like to talk further with a member of our team, please contact us at hello@samknows.com. Be assured — although the app is not available in Google Play, accessing the app is simple. The SamKnows Android team securely pushes the app to members of your organisation, which means emergency response teams can control who submits the data.